Interior Ministry officers, investigators and members of special services stand behind barrier tape in a settlement of the Novoselitsky district, where a local police station was recently attacked, in Stavropol region, southern Russia, April 11, 2016. 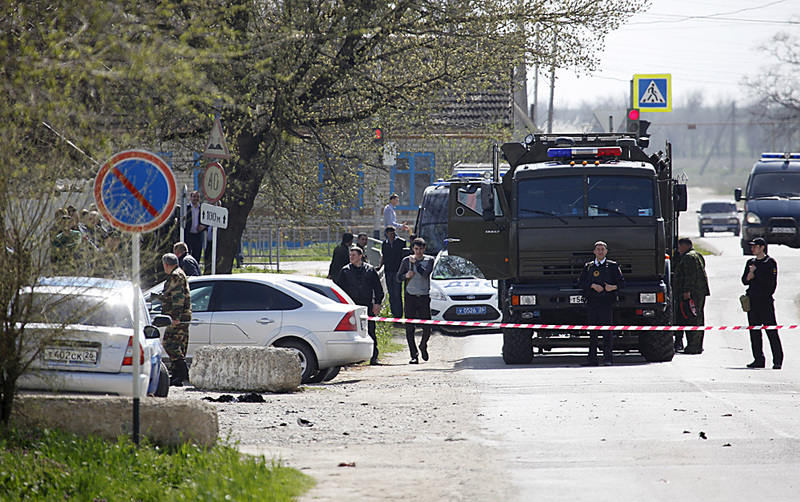 The anti-terrorist operation regime put in place on April 11 following an attack on a local police station has been lifted in the Novoselitsky district of Stavropol, the region's operative headquarters has reported. "The anti-terrorist operation regime is lifted in the territory of the Novoselitsky district from 1:00 p.m.," the report says. According to the headquarters, law enforcement officials identified the criminals and determined the addresses where improvised explosive devices and their components were assembled, the places where they were purchased, and also the circumstances of the crime. "Additionally, measures were taken to deal with the aftermath of the crime. Necessary investigative actions are being taken. The situation in the area is controlled by the law enforcement structures," the press release says. Further measures to normalize the socio-political situation in the district will be taken by the administration of the Stavropol Territory, the operative headquarters said. Three suicide bombers attacked the police station in the Novoselitsky district center on April 11 morning. Two of them were eliminated, and the third managed to blow himself up. There were no casualties amongst the police and the civilian population. The Russian Investigative Committee said that the identity of the assailants had been established. These are residents of the village of Kitayevskoye in the Novoselitsky district - Zaur Akayev born in 1983, Ramazan Khaibulayev born in 1991 and Isai Abdulatipov born in 1996.